Nutropical also commissioned a detailed laboratory analysis at Covance, one of the leading pharmaceutical and biotech research firms. The analysis found that borojo is rich in macro minerals and essential amino acids that are critical to healthy body function. Minerals found in large amounts in borojo include potassium, phosphorous, calcium and magnesium. These macro minerals are necessary for maintaining the body's central functions, staving off illness, and for cellular regeneration and growth. 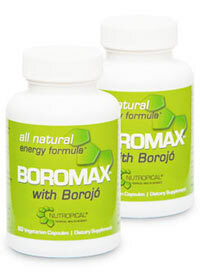 Borojo also contains amino acids such as lysine, tyrosine, leucine, and valine. These essential amino acids, which are the building blocks of protein and critical for healthy functioning, are not produced by the body and therefore must be supplied in the diet.